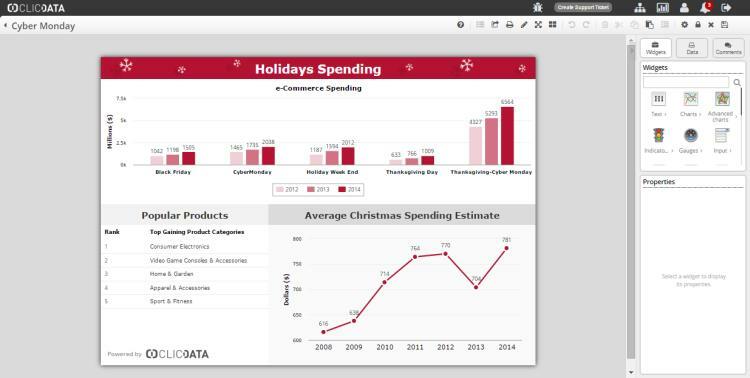 ClicData is positioned as an easy-to-use business dashboard application hosted on the cloud. It certainly fulfills this function well, making it extremely easy for users to load data and create dashboards. When I first reviewed ClicData some three years ago, it was clear that the product was being undersold simply to appeal to the tens of thousands of businesses whose data is not particularly complex, and who want a simple way to create dashboards. Underneath the easy-to-use exterior, however, is a platform capable of dealing with complex requirements. It comes with an inbuilt data warehouse, allowing data to be merged from several concurrent sources and a very capable language known as TSQL. This supports complex data manipulation and calculations. Many users may never need to be aware of these capabilities, but for those whose data are complex, and who need to perform complex calculations, these features will be essential. ClicData also supports the embedding of visuals in other applications and ‘white labeling’, so businesses can present the image they desire to people who use the platform. All-in-all ClicData is a very cost-effective platform for creating dashboards, and will not grind to a halt as requirements become more complex. 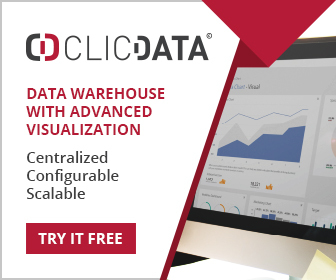 As with most contemporary visual analytics platforms, ClicData provides a drag-and-drop, menu-driven environment for the creation of visuals and manipulation of data. In its most simple form, this may simply be the act of dropping some Excel spreadsheets onto the interface and quickly building some visuals. Most users will want to create dashboards of one form or another, and users can drill down to detail, apply filters, create formulas, and do pretty much anything that might be expected of such a platform. Graphics can also have actions associated with them so that when a user clicks on a graphic an action is initiated. Rules can be created so that when data breach predefined thresholds an alert is generated. Dashboards can also be distributed via email, and users can even add comments to live dashboards. A ‘push’ paradigm is used as much as possible so that users do not have to log on to see dashboards. ClicData supports a wide variety of data sources, including flat files, databases, applications, and pretty much all commonly used data formats. Connectors to these sources are often in the form of wizards, making the connection task easier. The ETL capability of ClicData is adequate for most needs with functions such as normalize, transform and merge data sources. Data are loaded into the in-memory columnar database, which accounts for the high levels of performance on even large amounts of data (up to 100 million rows). The data in the warehouse can be set up to refresh automatically, and these updates are immediately reflected in dashboards that use the data. ClicData supports ‘white labeling’ so that businesses can present a stylized and branded interface to users. It also supports embedding (using iFrames), allowing visuals to be embedded into other applications. Access rights can be finely tuned to ensure security, and because ClicData is hosted on the Microsoft Azure platform, so businesses can often have their data hosted in their own country, avoiding data protection and privacy issues. ClicData was formed in 2008 and is headquartered in France. Despite the positioning as an easy-to-use platform for dashboarding, it has seen adoption in a variety of large customers, including Lexmark and the City of Sacramento. The company once offered a free plan, but now offers a free trial instead. The pricing is modest, and even the Enterprise Plan, supporting 50 users, is just $429 a month.